You have probably seen friends share birth images or maybe you have looked them up yourself. Birth photography has become increasingly popular. You'll find images all over Pinterest, Instagram, and blogs. These images all have one thing in common: emotion and connection. Whether it is the joy captured when you first see your baby or the pain you experience while laboring. Perhaps it is your partner holding your hand while you push or snuggling up to your new squish. 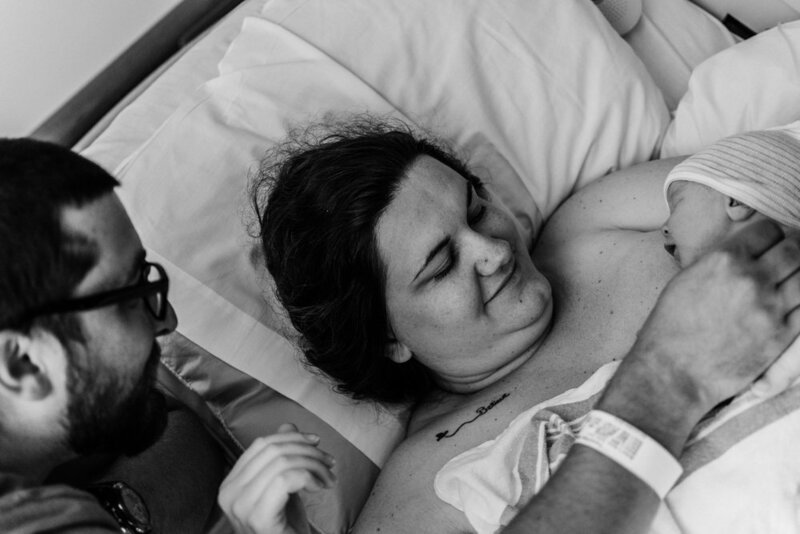 Birth photography is about documenting your birth and telling your story. Why would I want photos of my birth? Like your wedding day, it's a HUGE, life changing event. Being a parent is my greatest blessing. It has definitely changed my life for the better. Birth photography enables you to relive those moments when you brought your baby in to the world. Not to mention, babies grow so quickly. I'm still always amazed by how small we once were. Birth has no schedule. It can happen at any time. I have to be ready at any given moment to drop everything to be by your side during those weeks I'm on call. Sometimes that is 9am and other times that is 2am. I spend hours by your side. On average, I have spent roughly 12 hours at each birth. There is a period of time during your labor that things get a bit foggy. You are in that moment of bringing your child earthside. Things become clear again once you deliver. Having a birth photographer there, will ensure those moments are all documented and allows your birth partner to be present and supportive. When you look at your images, the memories start to come back and you can relive your birth experience. How "graphic" will my photos be? Most of my clients book me because of my uncensored approach. They want those raw, honest photos. With that being said, if that's not your thing, that's totally fine. I will document your birth exactly as you wish. Once you have booked your birth, I send out a questionnaire, which covers who and what you want photographed. I am interested in booking my story with you! When should I do this? Great! I only take a limited number of births per year, so the earlier you book, the better. I have booked clients as early as 12 weeks and as late as almost 40 weeks. There is a retainer of $300 to book your birth and for me to reserve the on call time on my calendar. The remainder is due by 36 weeks. I also offer payment plans upon request. My on call period starts at 38 weeks and I remain on call until you deliver. I ask that you update me after every appointment in the third trimester and of course, if you have any changes. No change is too small. Coverage starts when you are in active labor. I will come to your birth location when you are in active labor (about 5-6 centimeters). Once you deliver, I will stay about 1-2 hours after to capture those first moments. I will also deliver a sneak peak within 24 hours. Birth and postpartum photography are my jam! The rawness holds a special place in my heart. Our bodies are incredible. We make and grow tiny humans. We birth them and feed them. Let's savor every moment.